Follow the tips given below on how to grow tomatoes from seeds and seedlings taking care of mulch, water, fertilization, pruning, diseases and problems, and when to harvest tomatoes. A kitchen garden is incomplete without a tomato plant. A tomato plant takes up a relatively small space and can be grown in a pot, containers, grow bags or upside down pots or in ground in your garden, indoors or outdoors. It can be grown in upside down in a bag which does not need stacking. I have been growing tomatoes since last several years both in ground and containers, and it has been very rewarding and satisfying. My neighbors always envy my plants. If you don't have a garden bed or live in an apartment, you can grow tomatoes in pots in your balcony or terrace easily. There are two main types of tomato plants, tall-growing and bush type. Tall-growing varieties grow to a height of 2 m or more, requiring the support of stakes. Bush type varieties do not need the support of a stake. The bush varieties are dwarf and pendulous types which are suitable for hanging baskets. I have grown many varieties of tomatoes. I found that Cherry tomatoes are the sweetest of all and have little problems. Also they produce hundreds of fruits for months, hanging like grapes on the vine. Cherry tomatoes are relatively trouble-free and are not attacked by fruit flies, so they are ripened on the wines. I like "Tommy Toe" variety of cherry tomatoes as its size is about 3 cm, neither too big nor too small and the fruit is super-sweet. It is very easy to grow a tomato plant from seeds, although it is not free from some pest and disease problems. If you plan to raise the plants from seeds, start your tomato seeds indoor or in a warm location in late winter or early spring. If the temperature is too low, sow the seeds in a box covered with a glass sheet. Once the seedlings emerge (after 2-3 weeks), water regularly. Read details on Growing Vegetables From Seeds. When buying tomato seedlings, look for lush green color with dense roots emerging from the bottom holes of the container. Avoid plants that have grown too high or has more than 3-4 sets of leaves. Discard any weak or damaged seedlings. Transplant the seedlings to smaller pots, 3-4 inch size, burying the stems deeper than they stood previously, up to the first two leaves, to promote roots all over the stem. The advantage of putting seedlings in smaller pot is that it will bound the roots. After this initial transplanting, apply a pinch of sulfate of potash around the stem to produce super-sweet fruits. Feed seaweed solution and place the pots in sun. Transfer the plants in the ground or bigger containers after 2-3 weeks. The final place of the tomato plants should be sunny that receives at least 6 hours of sun, wind-protected and frost-free. Do not select the same spot in the garden if you grew tomatoes last year there to eliminate risk of soil borne disease. You can, however, plant at the same location after 1-2 years. Tomato plants are compatible with the most of the garden vegetables. The companion plants for tomatoes help in three ways. Some companion plants like mint, coriander, cucumbers, parsley, Sow thistle, etc. improve the growth of the tomato plants. Some plants like basil, coriander and parsley improve the flavor of tomatoes.There are some companion plants like amaranth, basil and garlic that repel pests and diseases. Avoid planting near cauliflowers, cabbages and apricot trees and potatoes to reduce white fly. I planted the bitter melons (growing bitter melons) or bitter gourds in the same bed as that of tomato plants to study the effect on the growth of both the plants. It appeared to me that tomato plants near the bitter melon plants remained relatively healthy and produced more tomatoes with good flavor and taste. The bitter melon plants grew normally. Prepare the soil at least a month before planting. Tomato needs free-draining, fertile soil. Prepare the soil by digging to about 30 cm deep and mix in compost, aged manure and fertilizer. Plant seedlings at least two feet apart. Choose a wide and deep pot with drainage holes at the bottom. Fill the pots with free-draining soil enriched with compost and organic manure. The advantage of growing in a pot is that you can move the pot where they can receive maximum sun. Put 6-8 ft long stakes or tomato cages in the soil at the time of planting or before planting to avoid root damage. The stakes will hold the plant upright and increase air circulation and exposure to sunshine, preventing fruit touching the ground and reducing diseases. After planting, mulch (2-3 cm) the bed to stop the spread of diseases and to conserve moisture. Any coarse organic matter like sugar cane mulch, lucerne hay or pea straw can be used as mulch. Read details on Which Mulch Should You Use Where. Tomatoes require lots of water. Water regularly on the soil without wetting the foliage to keep the diseases at bay. Avoid overhead sprinklers, instead use drip or trench irrigation. Tomato plants should not go thirsty for a few days in summer, as drying out will drastically reduce their yield. Tomatoes in pots can get dry out quite fast than those in the ground, so check the soil every morning and evening if it is dry. Plastic containers get very hot in summer, as high as 80 deg C. To avoid this, you can cover the tomato pot by placing it in another pot. Sprinkle a small amount of baking soda (dissolve 1 teaspoon in 5 liter water) on the soil around your tomato plants to make tomatoes super sweet. The baking soda in the soil will lower the acidity levels. Add only once when the plant is young, be careful the soil may already be alkaline. With your thumb and forefinger, pinch off suckers which are small shoots that emerge from the main stem or side stem at the base of each leaf, ensuring that only a couple of stems are growing per stake. When the tomato vine reaches the top of the stake, pinch back the tips to encourage new growth. Tomatoes are heavy feeders. Their nutrient requirement change as the plant grows. A fertilizer low in nitrogen and high in phosphorous and potassium is good. The fertilizer for tomato plant should contain high Phosphorus, then Potassium and then Nitrogen content. For example, N-P-K may be 8-16-12. I usually use homemade compost and well composted cow manure, however, one can use horse, chicken, rabbit, etc. can also be used. Rabbit manure can be applied fresh, it won't burn plants. Chicken manure is high in nitrogen that can harm the plant. Tomato plant need fertilizing again just as first fruits start to form. Give a liquid fertilizer for flowers and fruit every fortnight at first but increase to once a week as plants grow. I also give comfrey tea on alternate weeks. Leave your tomatoes on the vine as long as possible for ripening for maximum flavor. Pick the fruits when they are red in color and firm. If any semi-ripe fruit fall off, wrap it in a newspaper and store in dark place to ripen. Tomatoes are susceptible to insect pests like aphids, caterpillars (grubs), flea beetles, tomato horn-worms, tomato mosaic virus, red spider and white-flies, blossom-end rot and late blight. 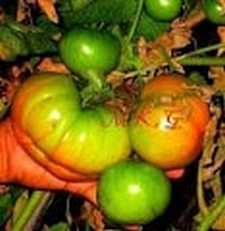 The tomato problems cause distorted leaves, gray moldy spots on leaves and fruit, leaves mottled with yellow spots, leaves becoming narrow and twisted, holes in the fruits, etc. The fruit fly may lay eggs into the fruit. Smokers should not touch tomato plants as it can spread tomato mosaic virus. Dust with sulfur to control several pests of tomato, however avoid it on hot days as it will burn fruit and leaves. Put baits and lures near the vines to control fruit flies. You can use yellow pieces of plastic covered with grease to attract and trap the flies. Cover the fruits with paper bags to protect from diseases. Remove infested leaves as soon as leaf spot or diseases appear. Practice crop rotation each season. On a very hot day, protect the tomato fruit from sunburn by creating shadow on the plant. Plant basil or marigolds or garlic near your tomato beds to deter aphids, white fly and other insects attacks. Garlic repels red spider mites. Some times you see that there are many flowers on the vine but very few tomatoes. This is due to pollination problem due to lack of bees. How to hand pollinate tomato plants. Why there are blooms but no tomatoes? Controlling blossom drop of tomatoes. The tomato fruits may suffer a variety of disorders due to water and temperature variations, inadequate sun light and lack of nutrition in the soil. In summer, the tomato fruits can suffer from russeting (rough skin surface), splitting, cracking and irregular concavities in the fruit, known as catfacing. This is caused by variation in temperatures and soil moisture due to uneven water supply or weather conditions. The cracking of the fruit can be avoided by keeping the moisture level constant with mulching and consistent watering.